Optimism reigned in markets around the globe this week, buoyed by progress in the U.S.-China trade negotiations and comments from Federal Reserve Chair Jay Powell that soothed interest-rate-policy fears and showed confidence in the continued strength of the U.S. economy. The S&P 500 index closed Thursday with its fifth straight daily advance—the longest such streak since September. Though the partial government shutdown is dragging into its third week, and we express our sympathies to everyone impacted, investors haven’t batted an eye. JPMorgan estimates the shutdown is causing a loss of about $1.5 billion every week—a paint chip on the $20 trillion 18-wheeler that is the U.S. economy. For the year through Thursday, the Dow Jones Industrial Average has gained 3.0%, while the broader S&P 500 has climbed 3.6%. The MSCI EAFE index, a measure of developed international stock markets, is up 3.9%. As of Thursday, the yield on the Bloomberg Barclays U.S. Aggregate Bond index has inched up to 3.31% from 3.28% at 2018’s end. On a total return basis, the U.S. bond market is flat for the year. The year is young, but so far, it’s been profitable. As you know, we thought the dramatic selloff at the end of 2018 was overdone. The panic that some investors apparently succumbed to simply wasn’t supported by the facts. The economy is still growing, interest rates remain low and unemployment sits near its lowest levels in decades. Despite all the chatter, an all-out U.S.-China trade war failed to (and might never) materialize—it doesn’t benefit either side of the negotiating table to engage in mutual self-destruction. Trade-war fears are likely to rile markets again before the March deadline imposed by the White House, but we expect cooler heads will prevail. The Dow and the S&P 500 indexes have risen on all but one trading day this year, yet the S&P 500 is still 5% lower than it was 12 months ago. Does that make stocks a buy? Logically, long-term investors should want to buy today if stocks are cheaper than they were a year ago. As noted above, Fed Chair Powell reassured wary investors in a public interview yesterday, stating that he doesn’t see a recession coming in 2019. “The U.S. economy is solid,” Powell said. “It has good momentum coming into this year.” Powell reaffirmed that policymakers have no timetable for additional rate hikes; instead they will be patient and only make moves as necessary. One of the Fed’s mandates is to maintain price stability—in other words, to keep inflation in check. With inflation muted (hovering around 2%), the Fed is not feeling pressure to raise the fed funds rate. The U.S. service sector accounts for just under 80% of our economy, encompassing everything from health care to tax preparation to taco trucks. A survey of business leaders indicates this part of the economy was firmly in expansion mode in December, even if the pace of activity has dipped since September. U.S. consumers spend two-thirds of their money on services, and with unemployment low and wages on the rise, further growth appears likely as 2019 wears on. As a reminder, last week we launched a recurring series of useful tips, suggestions and reminders put together by our financial planning team. If there are topics you’d like us to address, please contact us at info@bravercapital.com. The Internal Revenue Service recently increased contribution limits for retirement accounts. For anyone who’s still in the workforce, investing more in your retirement is one of the best new year’s resolutions you can make. Participants in 401(k) and 403(b) plans can contribute $19,000 to their accounts in 2019—a $500 increase from last year. Investors with IRA accounts also get a $500 boost; the annual limit has been raised to $6,000. If you’re over 50, you can contribute an additional $6,000 to a 401(k) or 403(b) account and an extra $1,000 to your IRA (the same catch-up limits as 2018). We encourage those who can afford it to contribute as much as they can as early in the year as possible. That way your money can enjoy the benefits of compounded gains sooner rather than later. Please contact your portfolio investment team if you’d like advice on how to maximize your 2019 contributions (and it’s also not too late to top off your IRA for 2018). Your future self will thank you! Next week brings key reads on manufacturing, retail sales, consumer sentiment and a bevy of reports on the housing sector, including building permits and new construction. Note that some data may be delayed due to the government shutdown. 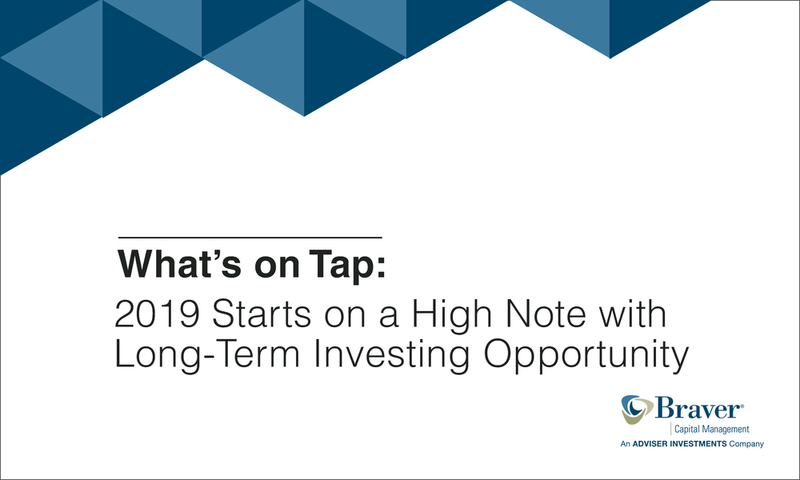 Please note: This update was prepared on Friday, January 11, 2019, prior to the market’s close.